IRVINE, Calif. – It’s quitting time on a warm southern California afternoon as the Santa Ana winds begin to kick up, blowing dust and dirt across the expansive parking lot in front of the Great Park Ice facility. Inside the cavernous 280,000-square feet, four-rink facility, the largest skating complex in California, it’s strangely quiet at the end of another full day of hammering and grinding as a construction crew of 300 strong works feverishly to meet the deadline of a Dec. 21 opening date. Even though the ice is still several weeks away from being installed over the concrete floor, the calendar of events is quickly filling up. One of the early commitments will be the 2019 USA Hockey Girls Tier I & Women’s National Championships, slated for April 4-8. The Anaheim Lady Ducks will serve as the hosts for the tournament. The Girls Tier I tournament will feature 48 teams, including 16 teams competing at the 14 & Under, 16 & Under and 19 & Under levels. The Women’s competition features Senior B and Senior C divisions and is currently slated to have 12 teams competing in each. 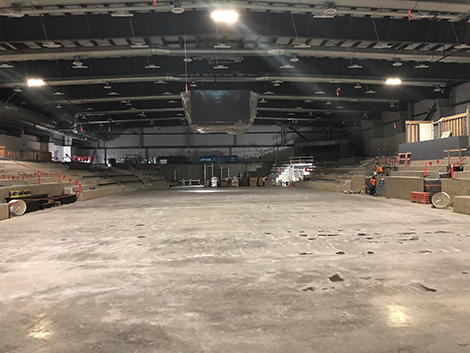 The centerpiece of the facility will be the FivePoint Arena, with seating for 2,500 people and a center ice scoreboard, concession stand and press box. There is talk of one day hosting a Junior team or even a Div. I college program, but for now both are little more than California dreaming. The Ducks' new practice facility sits roughly 20 miles from their primary nest in the Honda Center. The facility will include a restaurant, which runs the length of all four rinks, along with a Ducks team store and pro shop. 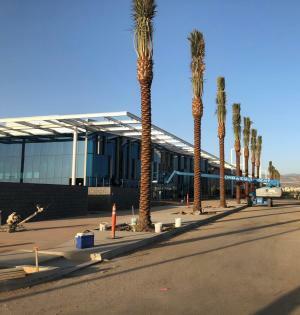 Another rink will serve as the practice facility for the Anaheim Ducks, which stands to reason as the team’s owners, Henry and Susan Samueli, have spearheaded the $108 million project on the land that was formerly the El Toro Marine Corps Air Station. According to Art Trottier, vice president of the Ducks’ RINKS program, the project has been in the works since the Samuelis bought the Ducks in 2005. “It’s been phenomenal to work with them. They have that mindset, ‘Let’s build the sport,’” Trottier told the LA Times earlier this year. The Ducks and the Los Angeles Kings, their neighbors located a few miles north on the I-5 corridor, have done a great job of growing the game both in terms of the number of players as well as those who are competing at the highest levels. According to the latest USA Hockey registration numbers, there are 11,739 youth and adult hockey players in Southern California. And when Great Park opens its doors next month more of them will have another first-class facility to practice their craft. But more than just hockey, the facility will be home to a variety of ice sports. It will be a training rink for U.S. Figure Skating, who will begin using the facilities early next year to train some of it’s for the ISU Four Continents championship, which is coming to the Honda Center in February. One of the rinks will be outfitted with special benches and boards that will be accessible for sled hockey players, and will include curling marks painted into the ice. Given the relationship between the Ducks and various elements of USA Hockey, it’s easy to see that more events will be heading west in the not too distant future.